"Iran can be considered as one of the ancient world’s empires, which methodically and actively was devoted to the development of the art of dance. For this ancient nation, dancing has been an important social phenomenon and a religious ritual." The origin and rise of Persian dance as an independent and distinctive art form is estimated to be parallel with the birth of Mithraism and its spread. This cult centrally revolves around the ancient Persia’s sun and light God, Mithra, who is the main figure in this mystery religion that during the late antique era spread over the entire Roman Empire. Numerous temples and depictions of the legendary Mithra have been located and excavated in the three continents of the ancient world; Asia, Africa and Europe. The latest discovery has been done in London as late as 1954. The most important ritual in this cult has been the worship of Mithra, as he is sacrificing a bull. This act was believed to promote the vigour of life. The consecration to this belief was accomplished among other rites through the baptism in the blood of a bull, followed by a ritual dance performed only by men. This ceremonial act is considered as the earliest known form of Iranian dance, and the origin of the magic dance of the antique civilisations. It is typical for sacred Persic (Persian) dance, so called “Danse Persique Sacrée”. The most significant bases for researching around the ancient Persian dance can be found in the Greek historian from Halikarnassos, Herodotos’ superb work “Nine Books”. He describes the old history of Asian empires and Persian wars until 478 BC. The cultural exchange with the ancient civilizations, particularly with Egypt and Greece has been extensive and proceeded during several centuries. 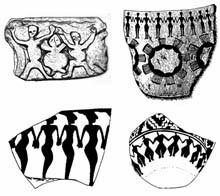 In various works by Greek historians “Persian dance masters” (choreographs and pedagogues) have been mentioned as they have appeared in antique Greece, and Greek “sportsmen, poets and dancers” have been sent to the Persian Empire. This cultural exchange has been described as one of the distinctive characteristics of ancient Persian culture, which gave rise to the term of “acculturation”, meaning the acceptance of new cultures. This was an evident quality for the legitimation and survival of an empire that ruled over numerous nations, from Egypt in North Africa, to India in Far East. It was the world’s first religiously tolerant empire and consisted of a multitude of different languages, races, religions and cultures. Achaemenians, the first ruling dynasty of the Persian Empire, contained several enthusiastic emperors who encouraged the advancement of different art forms. Ketzias, another Greek historian writes about the popular and talented female dancer, Zenon from Crete, who was Artaxerxés II:s (Ardeshir Shah II) court dancer and “the apple of the King’s eye”. Another Greek historian, Polukleitos, reports that at the marriage of Alexander the Great with the Persian woman “Roxana” in Susa, which continued in five days, he was amused by Greek musicians, singers and dancers who were engaged at the Persian Imperial Court. Contemporary history writers of our time, such as the French historian and professor Pierre Briant, has convincingly certified in his master piece “L’Histoire de l’Empire Achemenid” that dancing has been an important part of the religious worship among Achaemenians and in the faith of Zoroastrianism (another Persian religion that is still practiced all over the world). Xenophon emphasizes that this kind of Persic Dance (Danse Persique) has been very usual and as popular as “riding” because “Persic Dance, like a sport, strengthens the muscles”! The importance of the art of dance among Persians can clearly be viewed relatively numerous Greek history books. Different forms of dance have existed as they were performed on ceremonial, ritual or entertaining occasions. “For acquainting their horses with the tumultous scenes of war, the Persians used to execute a “military dance”, which meant that in a collective arrangement, clashing the weapons together rhythmically and dancing with their horses". Dancing was a well-developed and protected art form during the existence of other dynasties of Persian Empire, for instance Parthian and Sasanian. According to the Greek texts, there have been detailed descriptions for different forms of dancing, like fire dance, sword dance and even horse dance, which meant dancing while riding on horseback. No part of this publication may be reproduced, stored in a retrieval system, or transmitted, in any form or by any means, without the prior permission in writing of the author. 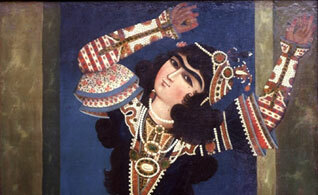 Visit Nima Kiann’s Forum of Persian And Middle Eastern Dance to find more articles.
? since 2002 Les Ballets Persans. All rights reserved. Office tel & fax: +46 (0) 8 440 2440. Email: info[at]balletspersans[dot]org.